Yesterday Digital Ocean published a customer story featuring Reclaim Hosting. It was nice. A month ago Tim and I talked with Lisa Tagliaferri (a CUNY Grad Center alum-I love CUNY!) who is keenly interested in framing the power and possibility of Digital Ocean for the education community—a vision I can definitely get behind. She though Reclaim Hosting’s move to Digital Ocean might provide a solid case study, and we were happy to oblige because we have nothing but love for Digital Ocean. Not only have they made the process of spinning up and managing infrastructure simple, they allow us to geolocate servers, they have amazing guides and tutorials, and they even dropped their prices this year. Hard not to love all that. So we had a discussion with Lisa to articulate why we’ve been so happy with Digital Ocean, and while the reasons are myriad (as mentioned above), probably the single most important element for us has been the introduction of block storage a couple of years ago. Mounting additional storage to droplets has meant we could move all of our shared hosting and Domain of One’s Own instances to DO, and over the last year that is exactly what we have done. We have just a few more servers to migrate over the coming months, and by the end of 2018 we will have completed what has been an almost two year-long migration schedule. That feels good, but it’s by no means the only advantage. Beyond scaling CPU and storage instantaneously—which you come to expect of cloud solutions—the ability to geo-locate servers around the world has become increasingly important for us with increased interest in Domains from schools in Canada and Europe. But the thing that remains special to me about Digital Ocean is their work epitomizes the challenge of making something that has heretofore been extremely complex (not only with dedicated servers, but through other cloud providers like AWS) quite simple and intuitive. Digital Ocean provides a peek at a future where managing your own personal cyber-infrastructure will not be that much more difficult that setting up your own WordPress site. 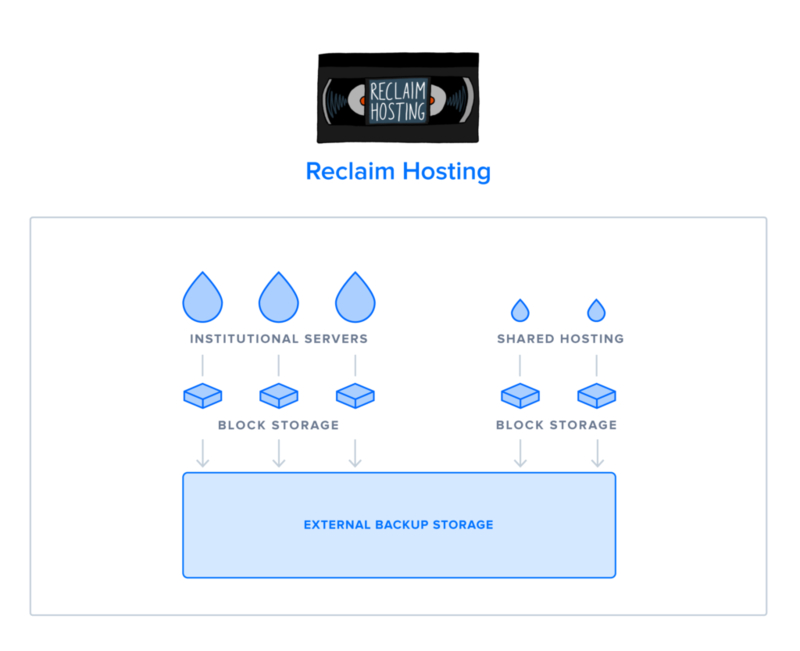 I do like the schematics they provide (even if Reclaim Hosting’s is dead simple), and they do a great job in the article of breaking down how and why we use Digital Ocean. I personally could not be more happy with our choice to move there, and cannot recommend them highly enough to other ed-tech folks who are in a position of managing their infrastructure externally, I can’t imagine a more painless alternative. This entry was posted in reclaim and tagged Digital Ocean, reclaim. Bookmark the permalink.